Before I start doing some serious cutting out on the hull, I thought it wise to install the drivetrain first, whilst the hull is at its strongest [before the supports go in after]. I bonded the propshaft skegs to the shafts with epoxy and let dry first and whilst I marked out the underside of the hull for all the installation points. The drive motor mounts are water cooled, just to help the motors out, well got to run cooling for the controllers so thought "why not". I have opted for rubber couplings due to the higher rpm these motors will spin up to. The motor mounts and propshaft skegs were cross drilled and small brass rods passed through to help bond with the glass fibre filler. Please note, I have not finished the bonding on the motor mounts, there is only so much you can reach to with the motors in situ, which I needed to do to ensure the drive train was as inline as possible. I do have some adjustment on the motor mounts for final trimming later. Progress is slowing a little on this build, it seems that every styrene part i cut out of the printed sheets needs either trimming to fit, or replacing with a larger item now. 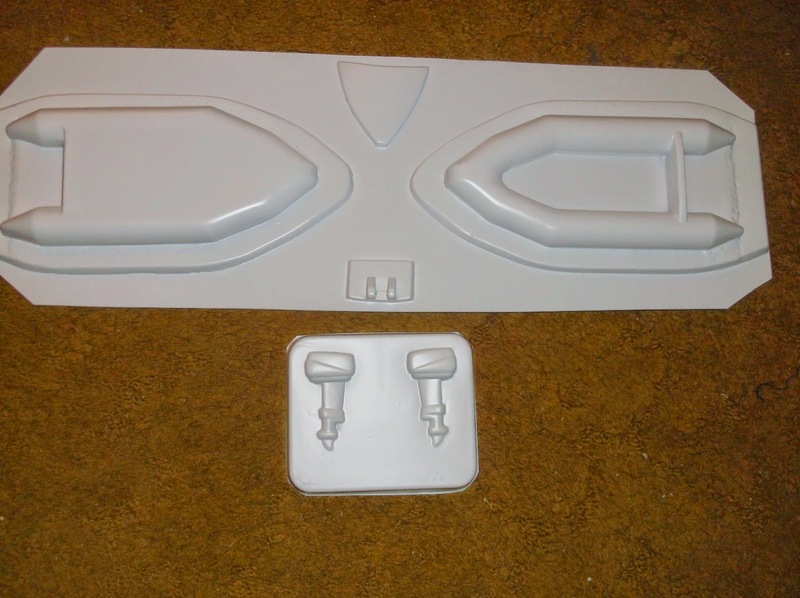 Id suggest that when the drawings were done, no account was made for the different thicknesses of the styrene used to build it, so every time you go to put more than two pieces together, at least two items need adjusting. Never mind, all part of the thrill of boat builds! The front windscreens now in, along with final roof panels, all having to be fitted almost at same time to get them in alignment. As well as replacing the two outer front screen panels, as the originals were wrong shape to accommodate all the angles. Well, suppose it had to happen. Being as im curently stuck ashore, as unable to sail on a Sunday, what better else to do than "build yet another boat "! Thanks to "eagle eyed" Mark, he put me on to an Ebay snip. A Tamar Lifeboat kit, opened but not started. Ok so the price was cheaper than buying "new" but its as good as. 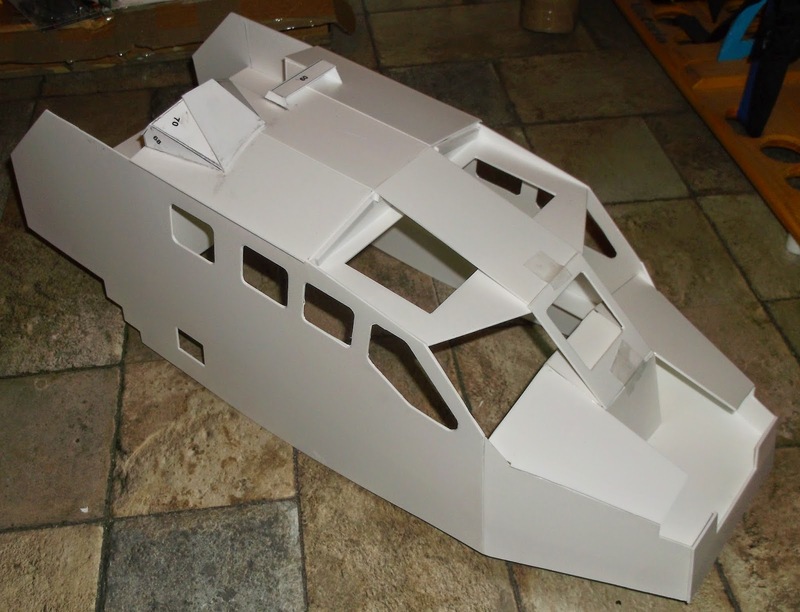 As you can see, its a kit for someone who likes building in Styrene and vac parts, right up my street to be honest. I am more at home working with plastic than trying to saw bits of wood and perform miracles of getting wood to not absorb water [ha ha]. The kit is definitely an "Ikea" jobby, loads of flat packed plastic parts, all needing careful cutting out and sanding before fitting together. Oh, heres a clue as to what it "might" hopefully look like once completed. Sunday sailing 12/2/15 & Rugeley Mc shooting event. Last Sunday proved to be the best sailing day for many a week. The conditions were as close to perfect as we could wish for in February with dead calm water all morning. It was good to see a very good turnout of members both old and new. With a large triangular course set out the fast boys held a number of incident free races. There was also quite a few club 500s present and again several races were held over an oval course, new member Vaughan acquitted very well and has made a very nice and very quick club 500, Richard took his very large Ayton Cross tug and his beautiful ChrisCraft launch.